Mount Messenger » Winter Weather: What’s Coming our Way? The groundhog predicted an early spring on Feb. 2, but is he right? According to the 2019 Farmers’ Almanac, a hub of weather predictions for the next 16 months, Punxsutawney Phil is wrong and winter isn’t letting up anytime soon. Here’s a look at the weather for the coming months of winter. Starting mid-February, there is going to be “blustery and bitter winds, a sharp drop in temperature and widespread snow showers/squall activity” in the Northeast/New England, Great Lakes, Ohio Valley, Midwest and Southeast zones. This means that the Mount and Hudson Valley can expect many more freezing days, similar to what occurred over the last few weeks since the spring semester began. As for snow, the Farmers’ Almanac sees a white winter ahead. Above normal snowfall is predicted for the Great Lakes, Midwest, New England and Pacific Northwest. 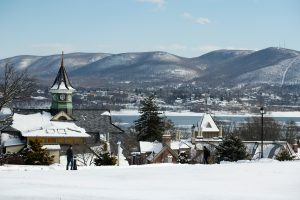 Although this sounds like it will miss the Hudson Valley, the Almanac also predicts “an unusually snowy and/or wet winter across the Pacific Northwest, Northeast and Mid-Atlantic States.” The snow certainly won’t be bypassing the Mount, so don’t bring your shovels home just yet. The burning question in most people’s minds is: when will winter end? The Farmers’ Almanac says that, especially for the East Coast, winter will hold out beyond the official start of spring on Mar. 20. It seems spring will be a little late this year, but at least Mount students can anticipate some snow days in their future.